So, two very unexpected and exciting things happened in March. First, my husband discovered that he had a few days of holiday to use up before the end of the month. Then our 19 year-old kindly volunteered to look after her brother and our dog so that my husband and I could go on a trip by ourselves. Yay! This was unexpected because when she did this last year for my birthday trip to Copenhagen (which you can read about in my post Travel tips and ideas for a weekend in Copenhagen), by the end of the weekend she and our son were so fed up with each other that I thought she’d never agree to be in charge again. But she did, either because she’s very kind, or because she’d forgotten how much she disliked doing it last time – or maybe a bit of both! Anyway, we ended up spending three nights in the sunny Algarve, Portugal’s southernmost region. The kids were fine – although both have instructed me never to leave them alone together again! 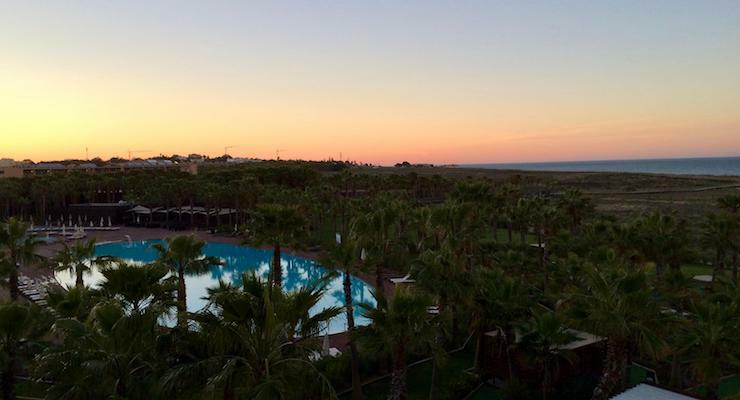 We arrived to blue skies and sunshine in Faro after a 6am flight from London Gatwick. We picked up a hire car from the airport and 40 minutes later we arrived at Vidamar Resort Hotel. Although the hotel’s check-in time is officially from 3pm, I’d called the day before to say that we had an early morning flight, and to ask for an earlier check-in if possible. Luckily our room was ready when we arrived and we were able to access it straight away, which I really appreciated. 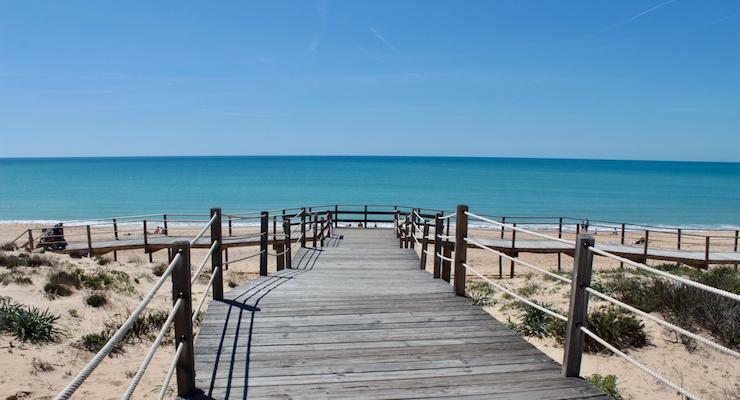 Five-star Vidamar Resort Hotel is next to Salgados Lagoon nature reserve, 10 kms along the coast from Albufeira. The lagoon is a haven for birds and the location is peaceful and unspoilt. 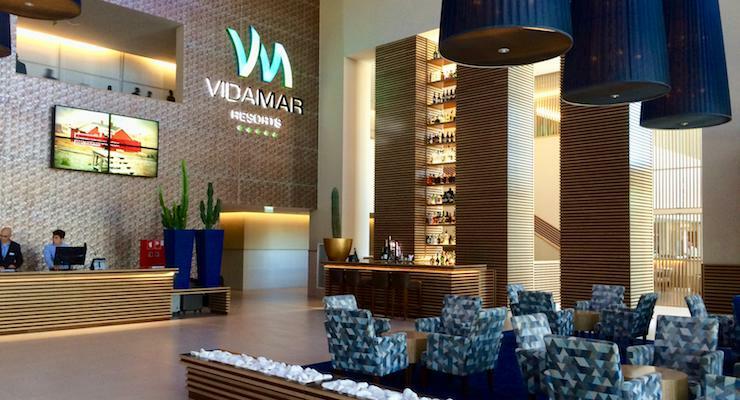 The Vidamar is a modern hotel which opened in 2013 and has recently been completely refurbished – the indoor pool reopened while we were there. The hotel has 260 guest rooms. Some parts of the hotel are just for adults (such as an adult-only section in the main restaurant), but it also welcomes families with children. We found the staff at the hotel to be friendly and helpful. The Vidamar has very good facilities, including three outdoor pools (one is 74 metres long, the other two are children’s pools), an indoor pool, a spa, treatment rooms, a gym, an indoor leisure pool, a kids club (for 4-11s), a games room, bars and direct access to a golden sandy beach. There’s an independent golf course next to the hotel. There are plenty of loungers around the pool area, but it’s a shame that the outdoor pools aren’t heated. 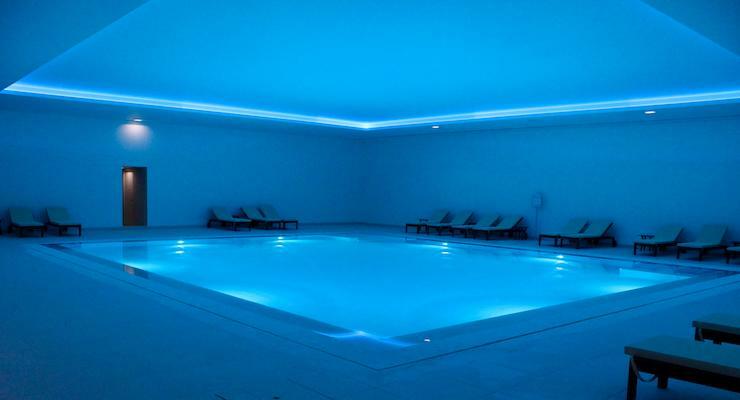 The spa wasn’t finished when we visited, but the indoor pool had just opened, and it looks like a relaxing place to swim. The resort has 65 self-catering villas next to the hotel. The villas all have private pools and are on two floors with en suite bathrooms. There are two, three and four bedroom villas available. 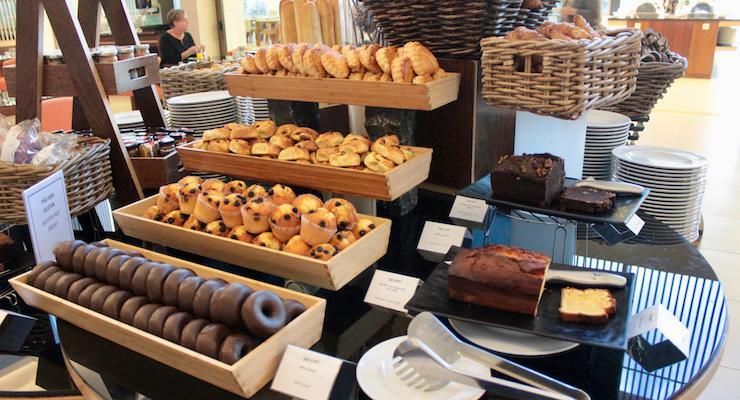 Villa guests can use the hotel facilities and can eat at the hotel if they pay an additional charge. I wanted to look inside one of the villas but they were all booked up when we were there, so I wasn’t able to do that. Most guests stay at the hotel on a half board basis, but we just had breakfast included with our room. The hotel has a buffet and three à la carte restaurants. Breakfast at the hotel is impressive. It’s served in the Ocean Buffet restaurant and really offers everything that you might want to eat in the morning. There’s a pancake and omelette making station, a fresh fruit section, a variety of breads and pastries and a whole load of hot options, including porridge, bacon and baked beans. We ate at the hotel on our first evening, at the buffet. If not included in the room rate, this costs 25 euros per person, plus drinks, and is served in the same place as the breakfast buffet. The food was fine. It was a Portuguese themed menu. I had salad and grilled sardines, which were good, then tried a dish of cod and vegetables which was too salty for my taste. There was a wide range of puddings, and I tried a home-made baked pavlova which was delicious. There were several vegetarian dishes available – the hotel’s very helpful concierge had given me a menu of meat-free options earlier in the day. The atmosphere in the buffet restaurant in the evening felt a tiny bit like a canteen, perhaps because it’s a large space and the decor is quite sparse. During the day there are views of the pool and the outside areas but in the evening you can’t see those views and it feels a bit bare. Disclosure: This review contains affiliate links, so if you clicked through and booked, I would receive a small commission. The Algarve Tourism Bureau helped us to arrange this trip. 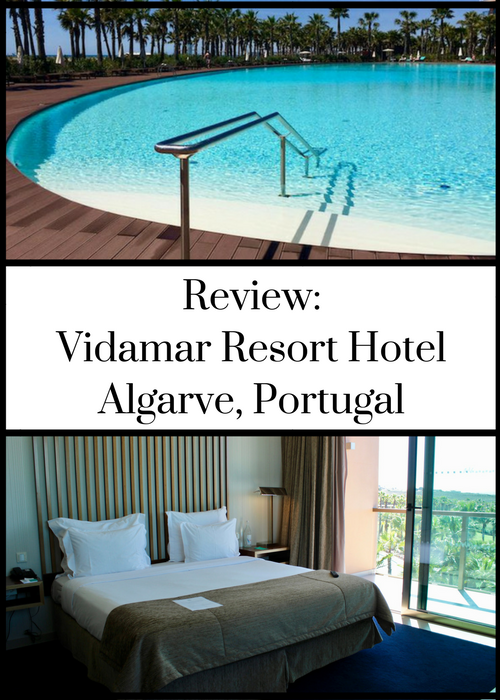 We were guests of Vidamar Resort Hotel for the purposes of this review. All opinions, words, images and videos are entirely our own, as ever.